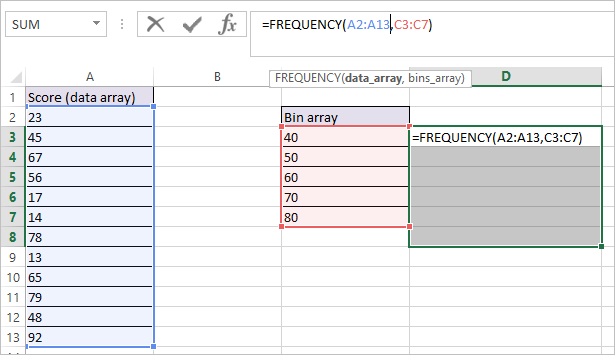 Frequency Function in Excel returns the Frequency Distribution of the supplied data array according to the bins that we supply. FREQUENCY Function in Excel returns multiple values and must be entered as an array formula with Ctrl + Shift + Enter, which we will explain in detail below. 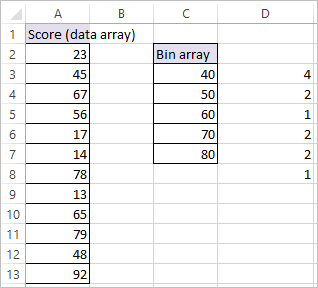 bins_array – An array of intervals (“bins”) for grouping the data_array. Let’s see how to create a Frequency Distribution using FREQUENCY Function step by step. Note: we need to select D3:D8, because frequency of values greater than 80 is captured in D8. 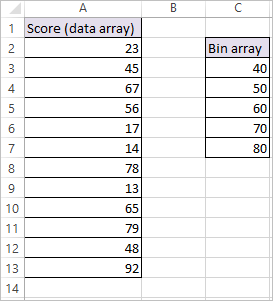 Note that the bins_array values specify the maximum values for the first two Score ranges. Therefore, in this example, the Scores are to be split into the ranges 0-40 score, 41-50 score, 51-60 score, 61-70 score, 71-80 score and 81+. There are 2 values between 41 and 50 (45, 48) so the Frequency for this bin will be 2 and so on. One value which is greater than 80 is captured in D8. Notes: FREQUENCY Function returns multiple values and must be entered as an array formula with Ctrl + Shift + Enter.